In Division IV football this fall, nobody did it better than Mahoning Valley teams. Want proof? Look who was selected as that division’s top players and coach for the 2018 All-Northeast Inland District. 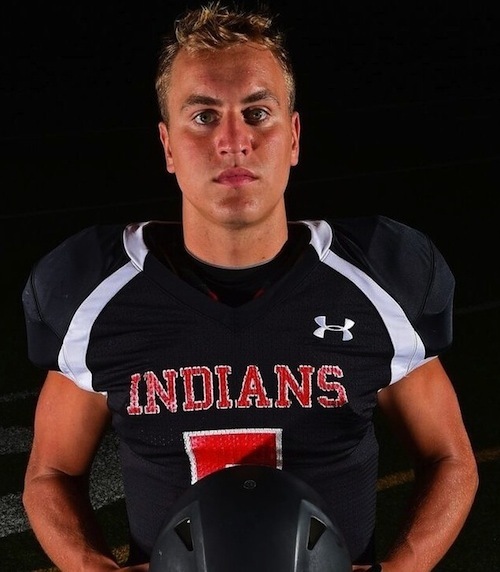 Girard quarterback Mark Waid was picked as the offensive player of the year, Hubbard linebacker Lukas Mosora was picked as best on defense and East’s Brian Marrow was named best coach after their teams enjoyed superlative seasons. 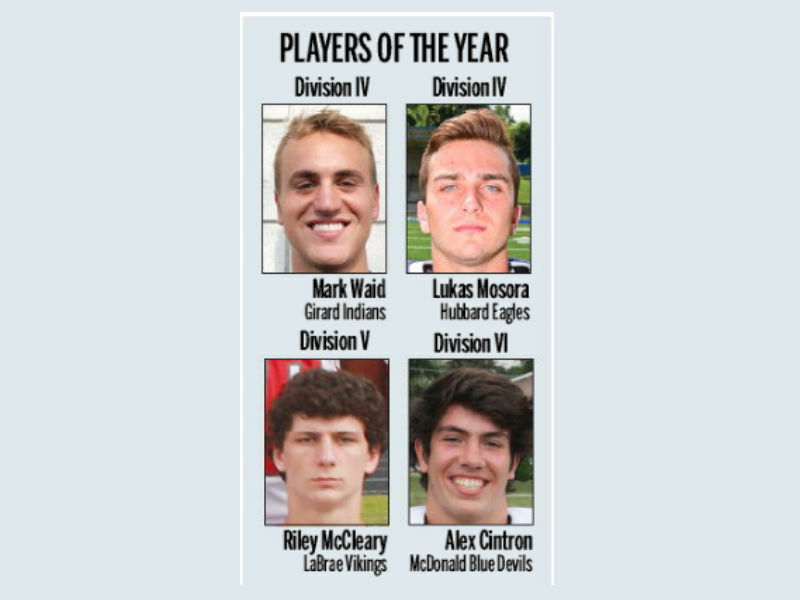 Also receiving top honors were McDonald running back Alex Cintron (Division VI offensive player of the year) and LaBrae linebacker Riley McCleary (Division VI defensive player of the year). In Division II, Warren Harding’s Steve Arnold was one of three chosen for coach of the year. In Division III, seven Canfield players were picked for the first and second teams. Three Austintown Fitch players were honored on first team in Division I. The all-district teams selected by a panel of area media outlets was released this morning. Waid and Mosoro will face off one last time Saturday at Niles’ Bo Rein Stadium in the Region 13 final. The winner will advance to next week’s state semifinals. Eleven weeks ago, Hubbard (11-1) defeated Girard (11-1), 48-32. The Indians haven’t lost since, earning the fifth seed in the region. On Nov. 3, the Indians ousted Marrow’s fourth-seeded Golden Bears, 34-30. Last Saturday, Girard knocked out top-seeded Perry, 42-33. Waid was unstoppable, rushing for 235 yards and passing for 321. In Ohio history, Waid is in the Top 10 for passing yards. Trying to contain him will be Mosora’s Eagles, whose only loss came in Week 10 against East, 26-21. Last Saturday, the Eagles upset defending state champion Steubenville, 34-16, a game not as close as the final score indicates. Led by Mosora, the Eagles did not allow a Big Red touchdown until the fourth quarter. Teammates of Waid and Mosora join them on the Division IV first time. 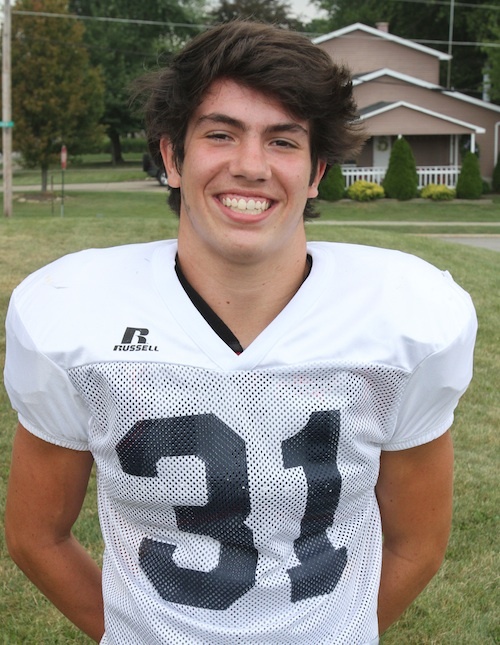 For the Indians, wide receivers Nicholas Malito and Aidan Warga and lineman Haeden Gump were picked on offense. For the Eagles, quarterback Davion Daniels and lineman Reese Best were selected. On defense, Girard lineman Jack DelGarbino and Hubbard defensive back JayQuan Odem were selected. East linemen Terrance Yeboah and Chris Fitzgerald, wide receiver Marquan Herron and defensive back Delshawn Petrosky were named first team. 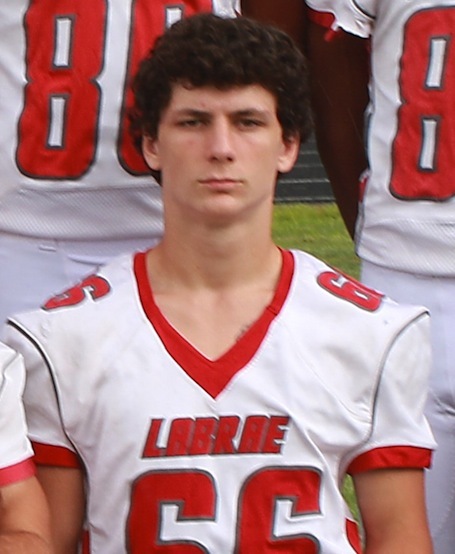 Other Valley players on first team are: Cardinal Mooney linemen Kyle Jornigan and Cheriff Jamison, linebacker Luke Fulton and punter Anthony Fire; Poland lineman Scott Campbell and linebacker Eric Shipsky; Ursuline defensive back Luke Pipala; and Salem defensive back Turner Johnson. 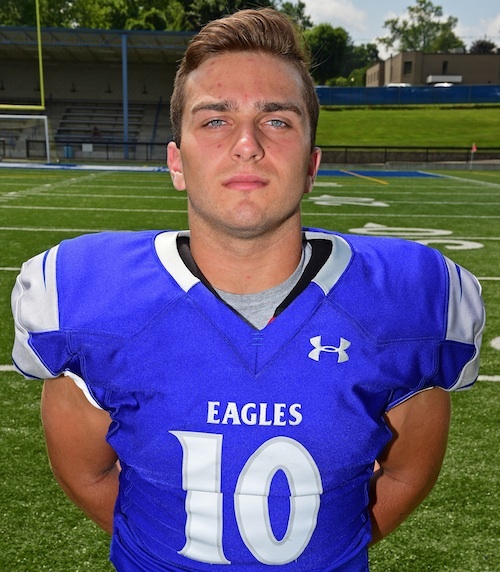 Also playing this week is Canfield (11-1), which has three players on first team: offensive lineman Jarod Tincher, defensive lineman PJ Hallof and linebacker Colin Hritz. The Cardinals will play Kenston on Friday at Warren’s Mollenkopf Stadium for their second regional title in 14 seasons. Also making first team were West Branch lineman Jacob Lyons and Niles running back Rob Savin. Six McDonald teammates join Cintron on the first team: offensive linemen Logan Marshall and Zach Nolf, defensive lineman Nate Dean, linebackers Zach Gray and Ali Hammond, and defensive back Josh Celli. The Blue Devils (11-1) won the Mahoning Valley Athletic Conference. Five Springfield (9-1) players are on the first team: quarterback Brannon Brungard, offensive lineman Ben Chaszeyka, running back Luke Snyder and defensive backs Shane Eynon and Zach Stouffer. The Tigers finished runner-up to McDonald. Also on the first team are Southern wide receiver Cam Grodhaus and defensive back Jayce Sloan, Columbiana lineman Erik Hopfenziz, Western Reserve lineman Brycen Jackson and United defensive back Ethan Antram. Fitch (9-2) earned its first playoff appearance since 2015. Powering the Falcons were first team selections Tommy Leskovac (offensive lineman), Dom Montalbano (linebacker) and Maleek Cheatham (linebacker). Arnold’s Raiders and Boardman are represented on the first team. For the Raiders (8-3), offensive lineman Maurice Moore, running back Kay’Ron Adams and defensive lineman Simahjay Warfield were picked as was Spartans (6-5) offensive lineman Tino Arcuri. Joining McCleary of the first team is LaBrae wide receiver Tyler Stephens, quarterback Kent Wolford and defensive back Walton Allie. East Palestine quarterback Parker Sherry also made first team. Last week, Sherry was selected one of the five national finalists for the Wendy’s Heisman scholarship program. Also on the first team are South Range linemen Tyler Dolak and Anthony Czap and Crestview offensive lineman Dominic Perry. Valley Christian has four players on first team: wide receiver Jordan Trowers, running back Altwjuan Beck-Lindsey, quarterback Milan Square and defensive lineman Terell Walker. Warren JFK, which is playing for its second regional title in three seasons, has offensive lineman Earl Hill, running back Isaac Hadley and linebacker Cameron Hollobaugh on the first team. November 13, 2017 7:01 a.m.
2007 YSU FOOTBALL RECRUITS All will be freshmen except Ben Nowicki who will be a junior.